Hertfordshire is one of the driest regions in the country and one of the biggest users of water in the country. Saving water is important but even more so now as, since July 2016, our region has received just over half of the normal rainfall that we would usually expect. Due to the low rainfall many rivers have seen flows decrease. 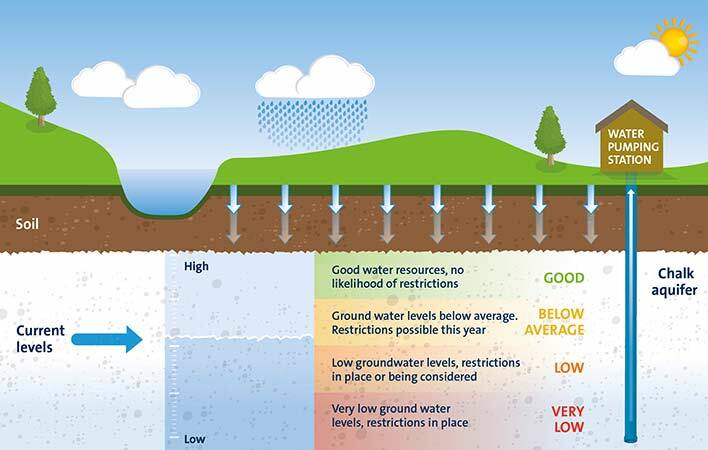 Ground water sources have also been affected by the low rainfall and are below average, this is where 60% of the water supplied to homes and businesses comes from. Affinity Water is encouraging its customers to save water to help preserve supplies and minimise the possibility of restrictions this summer. Affinity Water are continually monitoring our water resources position and are offering advice and free water saving devices to help their customers save water, energy and money at www.affinitywater.co.uk/savewater. There are many simple ways you can save water – doing a little, saves a lot! Use a watering can to water your garden (a garden hose or sprinkler can use almost as much water in an hour as an average family of four uses in a day and half). Take a short 4-minute shower instead of a bath. (A bath can use up to 100 litres, a shower uses about a third of this. However, be aware - modern power showers can use more water than a bath if you shower for more than 5 minutes). Turn off the tap while brushing your teeth (this can save over 6,500 litres of water per year). Install a ‘Save-a- Flush device if you have a single flush toilet. When boiling the kettle, only boil enough for your immediate use (this saves energy as well as water). Choose plants such as Rosemary, Thyme, Lavender, Ice Plant and Sea Holly as these are all drought resistant as well as being good for bees and butterflies.